Stewart Bushman ’95 nervously watched his computer screen one evening last July. 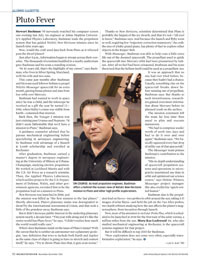 An engineer at Johns Hopkins University’s Applied Physics Laboratory, Bushman leads the propulsion system that has guided NASA’s New Horizons mission since its launch nine years ago. Now, would the craft send data back from Pluto as it whizzed past the dwarf planet? Just after 8 p.m., information began to stream across their consoles. The thousands of scientists huddled in a nearby auditorium gave Bushman and his team a standing ovation. “At 41 years old, that’s the highlight of my career,” says Bushman, who lives in Silver Spring, Maryland, with his wife and two sons. This came just months after Bushman and his team used leftover helium to propel NASA’s Messenger spacecraft for an extra month, gaining bonus photos and data from low orbit over Mercury. Bushman had wanted to work in space since he was a child, and the telescope he received as a gift the year he turned 12—1986, when Halley’s comet was visible from Earth—cemented that interest. Back then, the Voyager 2 mission was just cruising past Uranus and Neptune. “It didn’t seem fathomable that we’d have a mission to Pluto,” Bushman says. A guidance counselor advised that he pursue mechanical engineering before specializing in aerospace engineering. So Bushman took advantage of a Bausch & Lomb scholarship and enrolled at Rochester. 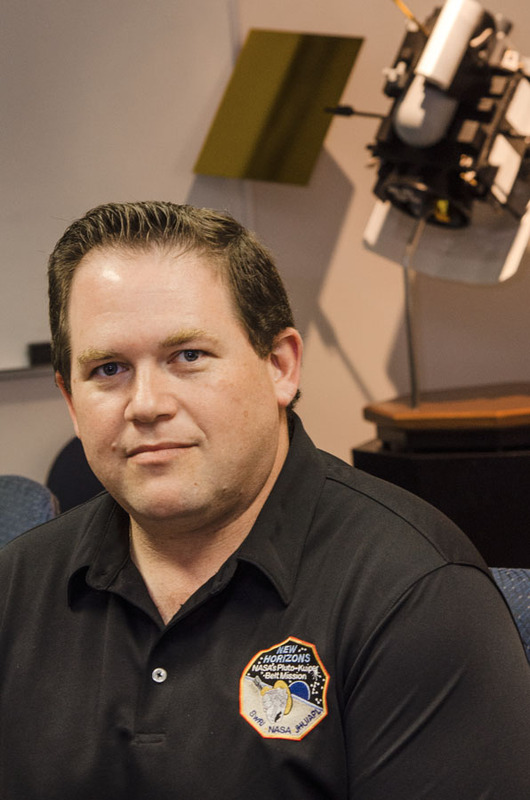 After graduation, Bushman earned a master’s degree in aerospace engineering at the University of Illinois at Urbana-Champaign, studying electric propulsion. He worked at Lockheed Martin and with the U.S. Air Force as a research scientist. Then, the Applied Physics Laboratory, which tackles projects for the U.S. Department of Defense, NASA, and other government agencies, recruited him to be the propulsion lead on a mission to Pluto. New Horizons was launched in 2006, and the mission was billed as “the first mission to the last planet.” Shortly afterward, Pluto’s planetary status was downgraded to dwarf by the International Astronomical Union, and that took a little of the grandeur away, Bushman says. Thanks to New Horizons, scientists determined that Pluto is probably the largest of the ice dwarfs, and that it’s red—“all cool to know,” Bushman says. And because the launch and flyby went so well, requiring few “trajectory correction maneuvers,” the craft, the size of a baby grand piano, has plenty of fuel to explore other objects in the Kuiper Belt. With Messenger, Bushman was able to help coax a little extra life out of the doomed spacecraft. The propellant used to guide the spacecraft into Mercury orbit had been pressurized by helium. After all its fuel had been exhausted, Bushman and his team theorized that the helium itself could be used as a propellant, too. It was an approach that no one had ever tried before, because they hadn’t had a chance. Usually, something else on the spacecraft breaks down before running out of propellant, Bushman says. But thanks to such inventiveness, researchers gained even more information about Mercury before its planned crash on the surface. The mission extension left the team far less time than usual to plan and execute maneuvers. The Messenger team praises Bushman’s contribution to the mission. Bushman also is the propulsion lead on Stereo—two probes in orbit around the sun, taking 3-D images of solar flares—and held the job on the Van Allen probes, two Earth orbiters studying how the sun affects the planet’s magnetosphere, from inception through launch. Now, most of his attention is on Solar Probe Plus, which is scheduled to be launched in 2018 for the first tour of the solar corona, a million miles from the sun. Mary-Kae Lockwood ’84, who also studied mechanical engineering at Rochester, is the spacecraft systems engineer for that project. But it will be difficult to top 2015 for Bushman. “New exploration does not come very often, especially transformative exploration,” he says.